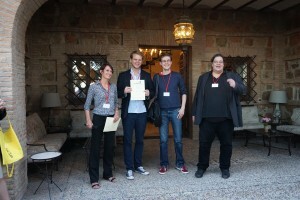 Posted 28.1.2011 12:00 by altmann & filed under Alumni. Cover story in CACM November 2013: I have co-authored an article on “Technologies for Caring for People with Dementia” with fantastic colleagues from the MIRROR project, which has been chosen to be the cover story of CACM 11/2013. The article covers our work on the Talk Reflection App in combination with other apps from the project. Thanks to the other authors of this paper and to the IMTM MIRROR people for this achievement. You can view the article at cacm.acm.org. Workshop on “21st century learning in the health and emergency sectors” at the European Conference for Technology Enhanced Learning (EC-TEL 2013) coming up as a clash of science and business: Join us in Cyprus and take the chance to get TEL more established in the sectors (see the workshop homepage for details. Workshop on “Collaborative Technologies for Working and Learning: ECTEL meets ECSCW” as a joint workshop of the European Conference for Technology Enhanced Learning (EC-TEL 2013) and the the European Conference on Computer Supported Cooperative Work (ECSCW 2013): We have accepted 12 good papers, looking forward to a great workshop; see the workshop homepage for details. Member of the program commitee for the 2nd and 3rd “International Workshop on Empirical Research in Business Process Management”, ER-BPM 2011 / ER-BPM 2012 at the Business Process Management Conference, BPM 2011 / BPM 2012. Organisation of workshop “Collaborative usage and development of models and visualizations” at the European Conference on Computer Supported Cooperative Work, ECSCW 2011. Member of the organizing committee for the workshop on “Augmenting the Learning Experience with Collaborative Reflection” at the European Concerence on Technology Enhanced Learning, EC-TEL 2011. My PhD thesis was concerned with the support of process model usage and development by knowledge management. Other fields of interest include phenomena of web 2.0 – especially social tagging systems -, semantic web, socio-technical system design, the transistion from personal to group information management and service process design and analysis. To get an impression of my interests, see my links and tags on Bibsonomy Titel: “Knowledge Management Support for the Development and Usage of Process Models as Artefacts for Knowledge Transfer” Only available in German Nowadays, process maps are being used by many companies for the documentation of processes, for their analysis, their optimization and implementation. Therefore, process maps contain relevant knowledge for organizations. However, practice shows that this knowledge is distributed unequally: While only a few people in organizations use process maps, many others are not aware of them or do not use them. The reason for this problem can be found in the lack of support for process maps by organizational knowledge management systems (KMS). These tools mainly support textual content. Therefore, knowledge being in principle available in organization is not used to full extent or even gets lost. Facing this problem, this thesis describes and implements potential solutions for the usage and support of process maps as content units of knowledge management. Based on an empirical study, a catalog of seven fields of action containing a total of 37 requirements is derived and implemented in prototypes. The resulting system allows the integration of process maps into KMS content by using social tagging as a means of semantic markup for process maps. Based on this, the system serves as a showcase for functionality supporting the usage of process maps for knowledge transfer. 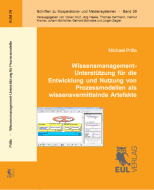 For the first time, this thesis gives a detailed and comprehensive description of problems and potentials of process maps in knowledge management. As part of this description, it described requirements, their implementation and links resulting functionality to organizational processes of knowledge management. Therefore, it contains practical advice for the usage of process maps as a knowledge resource in organizations. Moreover, it extends existing scientific insights into business process management and knowledge management as well as into the usage of process maps by non-experts and the design of cooperation support systems. Die Dissertation ist im EUL-Verlag erschienen.